Microsoft’s first Xbox One S hardware bundle has been revealed and if you’re a Gears of War fan, you’ll certainly want to check this out. With the Xbox One S Gears of War 4 Limited Edition bundle, Microsoft said it utilized advances in technology and manufacturing techniques to really free up their imagination. The idea was to create something that looks as if it was fresh out of battle; to do that, they used laser etching to simulate scratches and even a bloody thumbprint on the controller’s metallic D-pad. 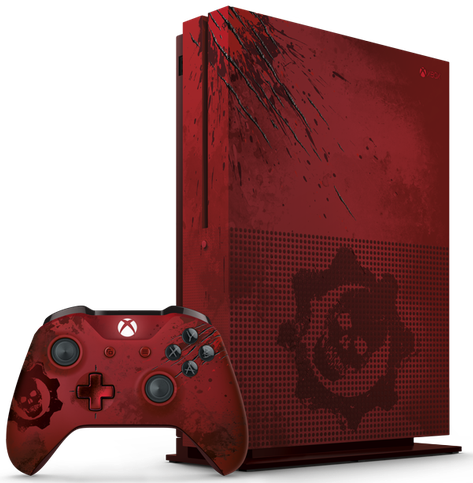 The bundle includes the console itself with a 2TB hard drive, a Gears of War 4 Crimson Omen Limited Edition wireless controller and a full game download of Gears of War 4: Ultimate Edition for both Xbox One and Windows 10. It doesn’t end there, however, as buyers also get a Gears of War 4 Season Pass featuring the exclusive Vintage VIP Pack, permanent access to future multiplayer maps for private games, six additional Gear Packs including the Vintage JD Gear Pack and early previews of upcoming modes. Gears of War 4: Ultimate Edition doesn’t launch until October 11 although those who purchase the bundle will get access a few days early on October 7. The Xbox One S Gears of War 4 Limited Edition bundle is available to pre-order today priced at $449.99. Expect it to ship in mid-September.